Stop the presses! 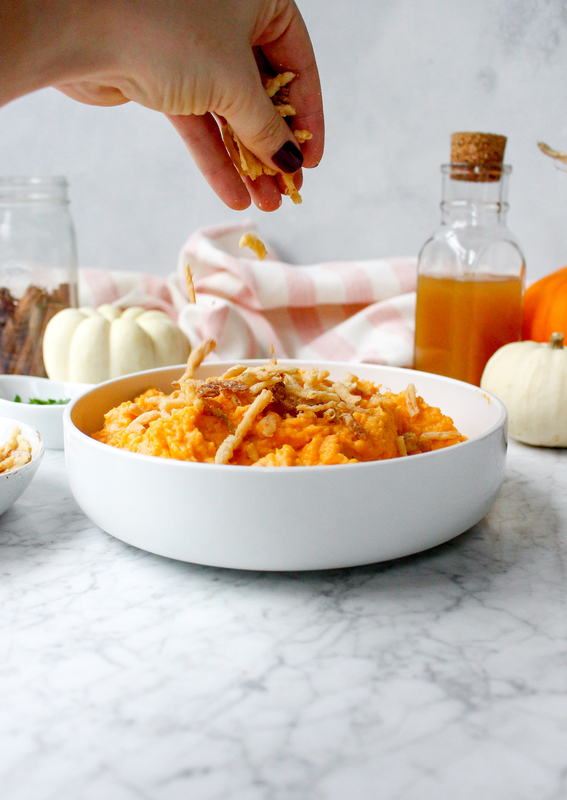 I have the ultimate side dish for your Thanksgiving festivities next week! These sweet potatoes. OMG. They are something special, for sure. Here’s the thing about me and sweet potatoes: I’m super picky about how they’re prepared. I do NOT like sweet preparations of sweet potatoes. I know, I know. I’m strange. 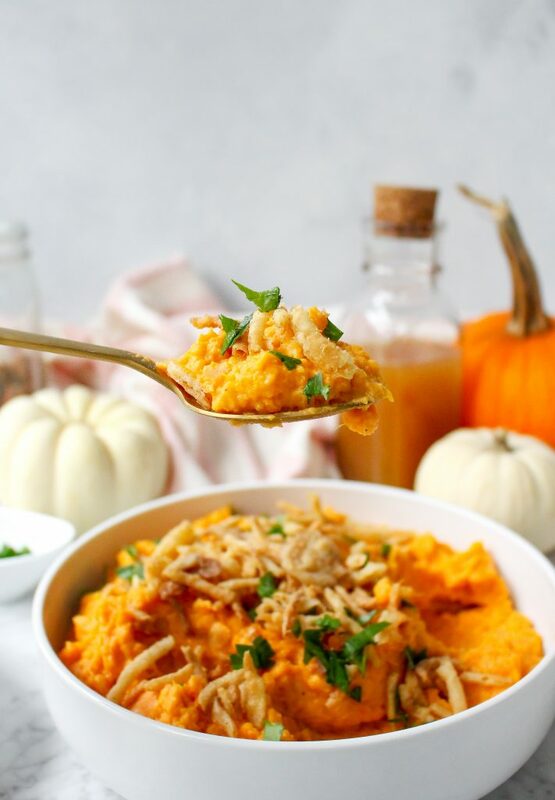 It is definitely not a popular opinion, especially given that the classic marshmallow and sweet potato casserole is a must have for many people on Thanksgiving. Not me. I did not grow up eating it (my parents apparently feel the same way as me) and have no nostalgia associated with that dish. It tastes like way-too-sweet candy, and I’m just not a fan. 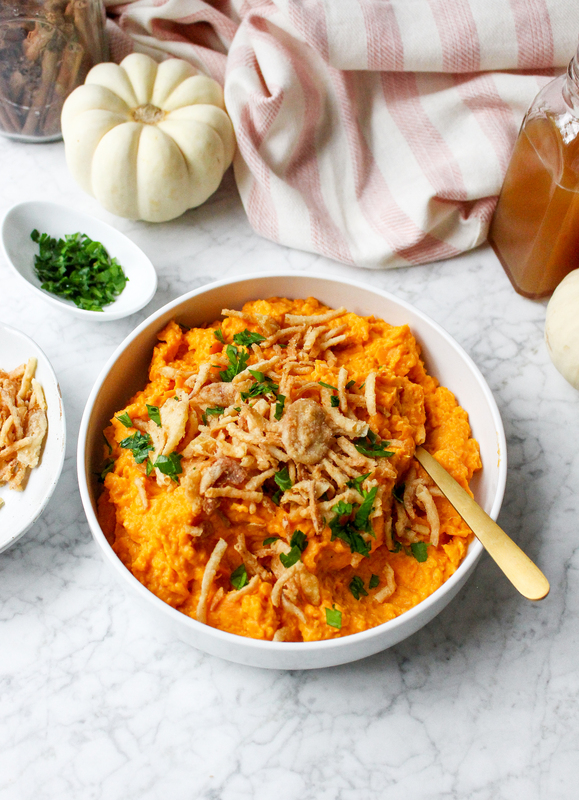 I so, so, soooo prefer savory preparations of sweet potatoes! They are already plenty sweet for me. So! I am always trying to come up with new and different ways to prepare and eat them whilst keeping ’em savory. My favorite way to eat them is simply baked and topped with a fried egg and doused in hot sauce, salt, and pepper. It is probably one of the best simple breakfasts out there. It rivals avocado toast! Really! Give it a try if you haven’t already. 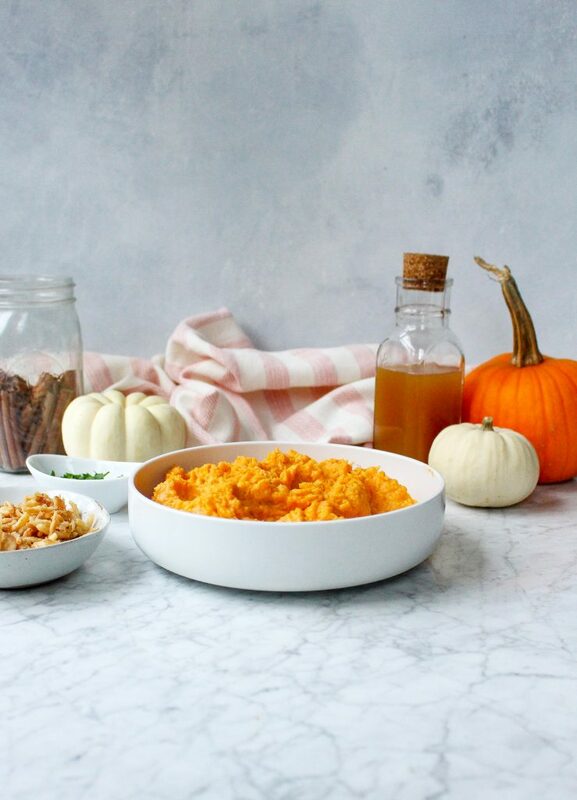 These apple cider sweet potatoes have something for everyone. There is apple cider IN the potatoes, so there IS a little sweet element added in, but it really isn’t overpowering. The cider imparts a nice apple flavor without adding a ton of sugar. I cook the sweet potatoes in a mixture of cider and water to really get that apple flavor in there, and then I also add more cider when I’m mashing them up (along with a little butter and sour cream for extra yumminess and tang). 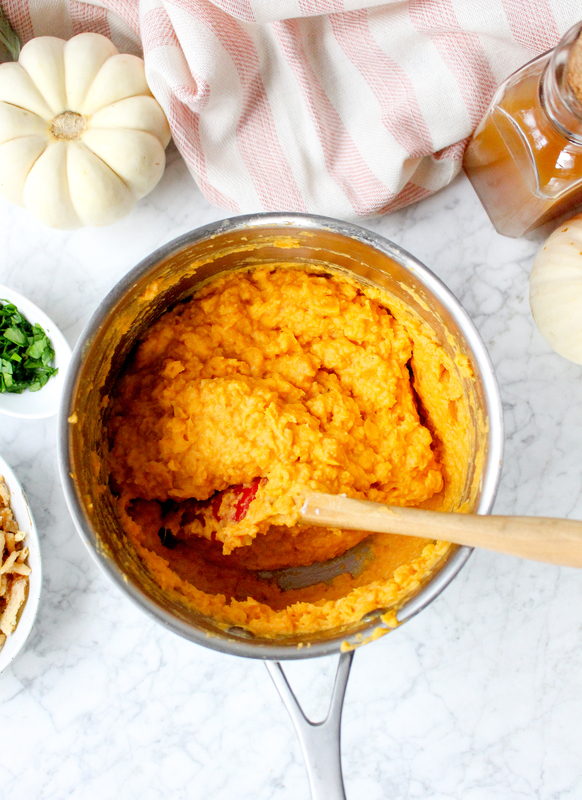 The resulting sweet potatoes are slightly sweet, spiced, and super creamy. 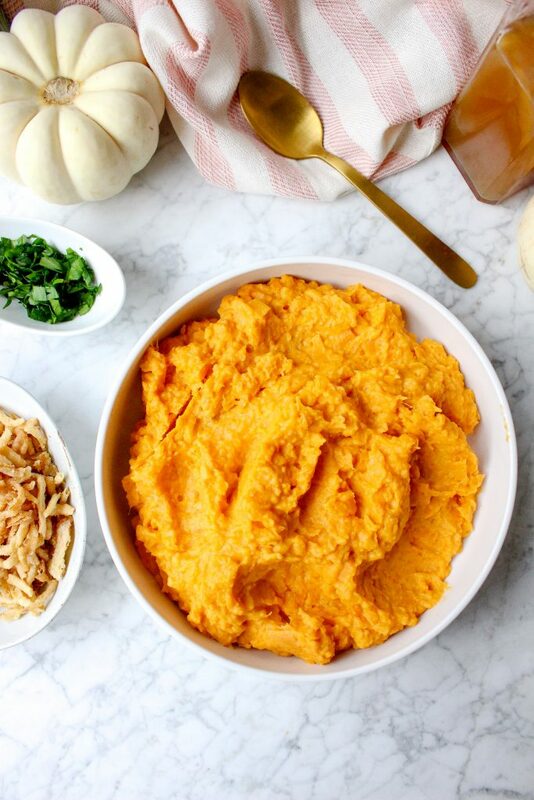 I actually prefer my sweet potatoes a little on the textured side, so I mash them by hand. If you want that super fluffy texture, then go right ahead and whip them up with a hand mixer! To each their own. I tested this recipe a couple times, and each time, I could not keep my damn spoon out of the potatoes. I ate an embarrassing amount both times this recipe was tested. Taking these pictures was torture! I wanted to dive in the entire time. I loved the flavor that the apple cider imparted and the slight tang and creaminess from the sour cream. It was glorious. 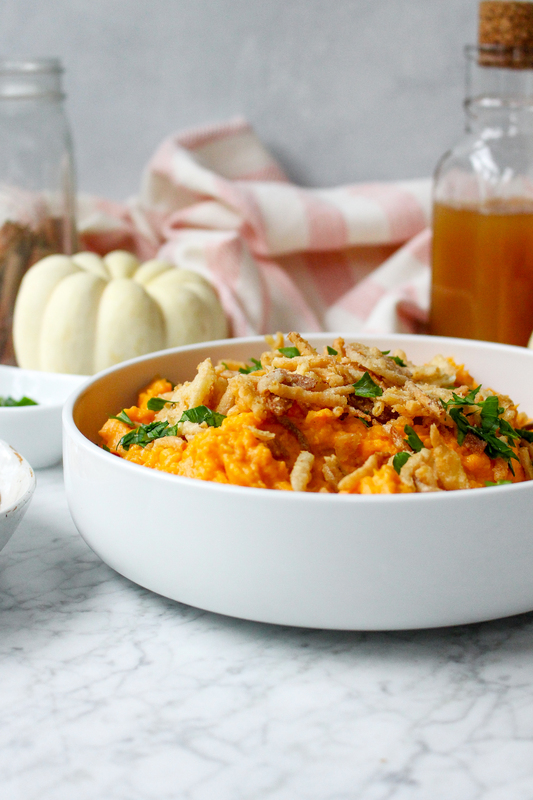 I topped those fluffy, spiced sweet potatoes with CRISPY ONIONS (and lots of fresh parsley…but that’s not nearly as exciting, hah). To make my life easier, I used the crispy onions in a can that people use most commonly on the classic green bean casserole. No regrets, either, because they are flippin’ delicious. AND it saved a ton of time and effort in the kitchen, and I think that’s a goal of just about everyone on Thanksgiving! If you’re feeling ambitious, you can of course make your own. That will really wow your guests. AND make your kitchen smell like heaven. Well, heaven if you’re an onion fan. Hah. The texture and flavor that the onions add is SO KEY here. I highly, highly recommend them. Crispy, crunchy, salty, and completely addicting. That’s how I’d sum up the crispy onions. They add my oh-so-needed savory bite, and for me, they take these sweet potatoes to a whole new level. The best part? This side dish is pretty simple. 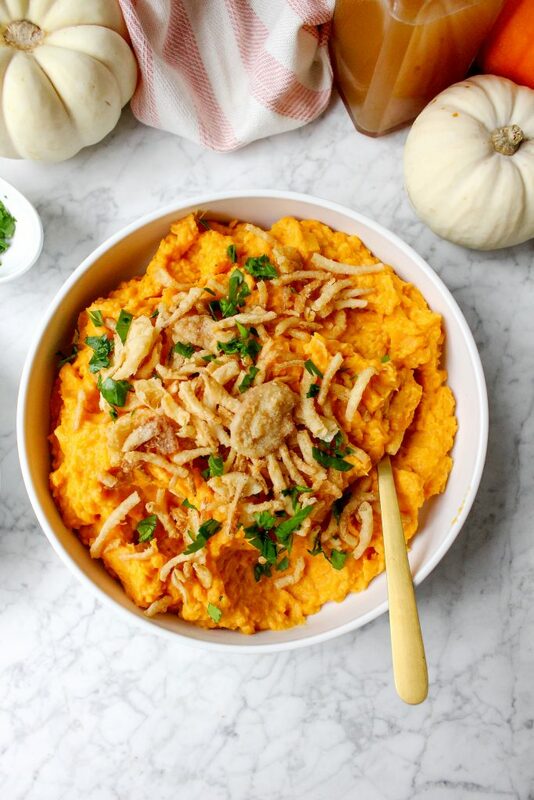 You cook and mash some sweet potatoes, pile them up in a bowl, and generously top them off with herbs and the crispy onions from a can. It is a stress-free dish that people will LOVE. That right there is a little bite of dreams. 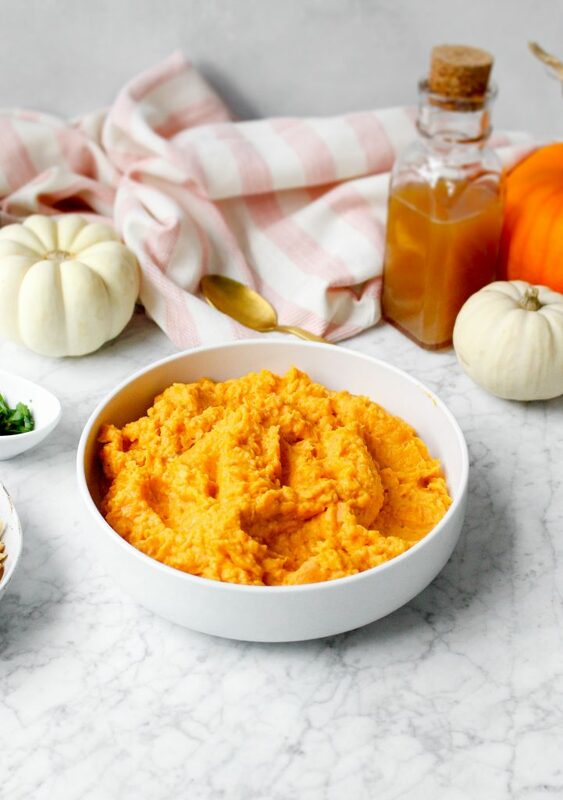 In a large pot, combine the sweet potatoes, 1½ cups of the apple cider, salt, and the cinnamon stick. Add enough water to cover the potatoes. Bring the water/cider to a boil and then simmer for 20-30 minutes, or until the potatoes are very tender. Drain and return the potatoes to the same pot. Discard the cinnamon stick. Mash the potatoes with the remaining ½ cup apple cider, butter, sour cream, and another pinch of salt. Mash the potatoes until they are creamy and smooth. Season, to taste, with additional salt and the pepper. Pile the mashed potatoes in a large serving dish or bowl and garnish with the crispy onions and some chopped parsley. Serve immediately while warm.